At Bonhams London on Wednesday, February 6, a Travel and Exploration sale, in 205 lots. Expected to lead the way is a sledge from the 1907-1909 British Antarctic Expedition (known as the “Nimrod Expedition”), estimated at £60,000-100,000. A first edition of David Roberts’ The Holy Land (1842-49), once owned and annotated by noted Blake collector Alice Grace Elizabeth Carthew, could fetch £25,000-35,000. 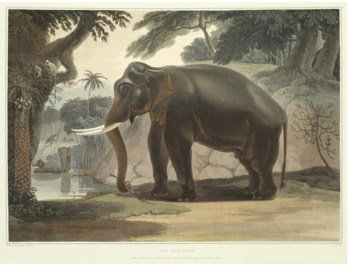 Among the other top-estimated books is a set of the illustrations from Samuel Daniell’s Picturesque Illustration of the Scenery, Animals, and Native Inhabitants, of the Island of Ceylon (1808), at £10,000-15,000 (pictured below). Forum Auctions holds an online sale of Modern Literature & Illustrated Books on Thursday, February 7, in 268 lots. Prices are expected to mostly be in the three-figure range here, though a pair of Russian avant-garde titles from the 1910s and a copy of the final Harry Potter book, signed by J. K. Rowling, are all estimated at £1,000-1,500. There are many other lots of Russian literature and a few more Rowling-signed books, as well as a number of intriguing lots of small press material. Finally, PBA Galleries will hold a sale in Oakland prior to the California International Antiquarian Book Fair: The Book Fair Century: One Hundred Fine Books - Plus Books Sold to Benefit the ABAA Benevolent Fund. Among the 75 lots sold for the ABAA Benevolent Fund are several Blake editions by Trianon Press (Lots 6-7); a first printing of Hawthorne’s Marble Faun ($200-300); and a portfolio of Whittington Press posters ($1,000-1,500). Other expected highlights include a copy of the first edition in English of Aristotle’s Politics (1598), estimated at $20,000-30,000; a first edition of Hobbes’ Leviathan ($15,000-25,000); an inscribed copy of Dashiell Hammett’s first book, Red Harvest ($15,000-20,000); and a small collection of material relating to Nabokov’s butterfly research ($10,000-15,000). Theodore Roosevelt’s copy of Mark Twain’s The Celebrated Jumping Frog of Calaveras County is estimated at $4,000-6,000. A Thomas J. Wise forgery, sold with a copy of Wise’s Swinburne bibliography, could sell for $1,000-1,500. At Bonhams London on Wednesday, February 6, a Travel and Exploration sale, in 205 lots. Expected to lead the way is a sledge from the 1907-1909 British Antarctic Expedition (known as the "Nimrod Expedition"), estimated at £60,000-100,000. A first edition of David Roberts' The Holy Land (1842-49), once owned and annotated by noted Blake collector Alice Grace Elizabeth Carthew, could fetch £25,000-35,000. Among the other top-estimated books is a set of the illustrations from Samuel Daniell's Picturesque Illustration of the Scenery, Animals, and Native Inhabitants, of the Island of Ceylon (1808), at £10,000-15,000 (pictured below). Finally, PBA Galleries will hold a sale in Oakland prior to the California International Antiquarian Book Fair: The Book Fair Century: One Hundred Fine Books - Plus Books Sold to Benefit the ABAA Benevolent Fund. Among the 75 lots sold for the ABAA Benevolent Fund are several Blake editions by Trianon Press (Lots 6-7); a first printing of Hawthorne's Marble Faun ($200-300); and a portfolio of Whittington Press posters ($1,000-1,500). Other expected highlights include a copy of the first edition in English of Aristotle's Politics (1598), estimated at $20,000-30,000; a first edition of Hobbes' Leviathan ($15,000-25,000); an inscribed copy of Dashiell Hammett's first book, Red Harvest ($15,000-20,000); and a small collection of material relating to Nabokov's butterfly research ($10,000-15,000). Theodore Roosevelt's copy of Mark Twain's The Celebrated Jumping Frog of Calaveras County is estimated at $4,000-6,000. A Thomas J. Wise forgery, sold with a copy of Wise's Swinburne bibliography, could sell for $1,000-1,500.